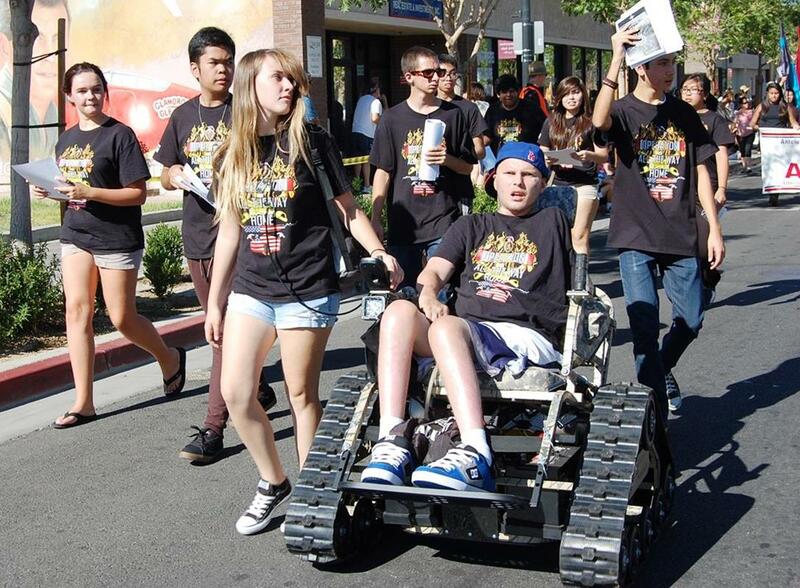 Lancaster High School students brought “Operation All the Way Home” to the AV Fair Parade on Aug. 17. The students will receive the first “Veteran’s Community Service Award” for their commitment to raising the funds necessary to purchase a family home for disabled Antelope Valley veteran Jerral Hancock (sitting). LANCASTER – High Desert Medical Group, long known for its “Senior of the Year” award, presented at the annual Senior Expo, will add a significant new award this year called the “Veteran’s Community Service Award”. This inaugural award will be presented to the Lancaster High School senior class, who through their organization “Pride of the Nation”, challenged the community “to take the Oath” and support their effort to raise funds for a wounded warrior. It was the seniors in Mrs. Jamie Goodreau’s history class who, through commitment and hard work, converted their concept to reality. The O.A.T.H. is an acronym for “Operation All the Way Home” and became the battle cry for these students who pledged a year of their life to raise the funds necessary to purchase a family home for a severely disabled soldier. The story of Antelope Valley veteran, Jerral Hancock, has been well-publicized, but it took a class of high school students to rally and commit to a course of action that would result in finding a home for the father of two. Hancock suffered massive injuries in 2007 when his tank, on patrol in Iraq, rolled over and triggered an E.F.P. (Explosively Formed Penetrator). He lost his left arm and sustained burns on most of his body, with shrapnel piercing his spinal cord and paralyzing him from the chest down. The presentation of the award will be made in partnership with the office of Los Angeles County Supervisor Michael D. Antonovich. Along with High Desert Medical Group, Senior Field Deputy Norm Hickling will make the presentation at the annual Senior Expo on Thursday, October 3 at the Antelope Valley Fairgrounds.